The internet was recently entranced with the observations of a 66-year old American visitor on his visits to the UK. Among gems such as ‘avoid British wine and French beer’ he posted to Facebook, he also gave Americans visiting the UK the dire warning that “you’d better like peas, potatoes and sausage”. But tourist Scott Waters also gave some practical cultural advice. ‘Displaying your political or religious affiliation is considered very bad taste’ he advises, and also points out that ‘if someone buys you a drink you must do the same’. You can read the rest of Waters observations on the UK here. This is the kind of advice that’s useful for those people doing business abroad. Attitudes to life, organizational hierarchy, dress, social manners and life in general vary from country to country. It’s important to get these things right when traveling for business. Cultural understanding can be of most significance when you’re trying to build a relationship based on trust, confidence and mutual understanding for business purposes. For those attempting to do business abroad, the most common hurdle faced is often the business meeting. Brazilian meetings don’t always have an agenda and when they do, it’s frequently ignored. In Germany meetings are taken seriously and follow a rigid agenda with the aim of deciding outcomes and making decisions. In China however, meetings tend to be used for relationship-building and gathering the information that will be used to make the eventual decision away from the meeting room. It’s very important to save face in Chinese society, which is why firm decisions are usually made outside meetings where there can be no loss of face to either party if the outcome is unfavourable. This is very different to countries such as France or America, where open conflict is seen as both healthy and acceptable. Of course, in a modern business, things aren’t so rigid as they used to be. In countries with a history of immigration, it’s common for a team to include a number of nationalities. One London-based psychometric testing company found one of their departments happened to include a lot of people from a south Asian background, which gave the team’s working relationships their own particular character. But in ethically homogenous Japan, you’re less likely to find diversity within working teams. Some innovative modern companies also experiment with meeting styles to make them less formal. It’s worth trying to determine how the organization approaches meetings or ask if there’s a plan for the meeting ahead of your arrival in the country, so you have some idea of what to expect. The speed and process by which organizations arrive at decisions can vary greatly. Risk-averse Japanese people tend to take their time – and hold multiple meetings – to explore every angle before committing. It’s considered vital that agreement is reached across the business about a course of action before a final decision is made. But things move much faster in America, where decision-making is less process-driven and not every angle has to be considered in quite as much detail and depth as a Japanese organization would favour. In Sweden there’s a similar view to Japan that decisions need to be based on consensus, so it’s more common to go through a lot of meetings to find direction. You’ll also see very different approaches to business hierarchy as you move around the world. As a loose generalization, Asian countries favour a more rigid and formal hierarchy than is the case in the West. Japanese business hierarchy defines clear functional barriers for all members of the business. In China, a strict social hierarchy is observed which will extend to where each member of the team sits at a business dinner and the order they enter the room for a meeting. By stark contract, in Sweden organizations typically have a fairly flat hierarchy and every worker is seen as making an important contribution. Sweden’s also a culture where work-life balance is held in high esteem. In countries such as Sweden and Finland long working hours aren’t encouraged. You’ll also see family-friendly and flexible working arrangements, such as the ability to work from home. But head to Japan and it’s considered important to dedicate yourself wholeheartedly to work rather than cultivate a life outside the office. This is one of the reasons Japan as such long working hours and it’s unusual to find employees working from home. Visitors to Britain often remark how fond British people are of small talk, even in a business context. In Germany, by contrast, they just want to get down to business. Chit chat about petty matters is seen as rather insincere. Head to a meeting in Brazil and you can expect to spend some time engaging in chat before the real business of the meeting is covered. You’ll probably spend even longer doing this if you’re visiting Nigeria for business. You may spend several hours discussing family matters and health before work begins as it’s considered important to establish personal relationships first. Some cultures place greater emphasis on a particular type of communication. French and Germans have a love of written communications. True to stereotype, Germans expect this to be precise and the French value correct grammar. But head over to Brazil and you’ll be taken more seriously for what you say than what written materials you provide. Oral communication is given greater emphasis in Brazilian organizations than written one – so even if you send an email it’s worth following up with a phone call to ensure your point gets across. Doing business abroad may seem intimidating with the differing approaches to working life seen above. But having a good grounding in important cultural elements can help smooth over any minor mistakes, particularly if there is a general sense of goodwill on both sides. 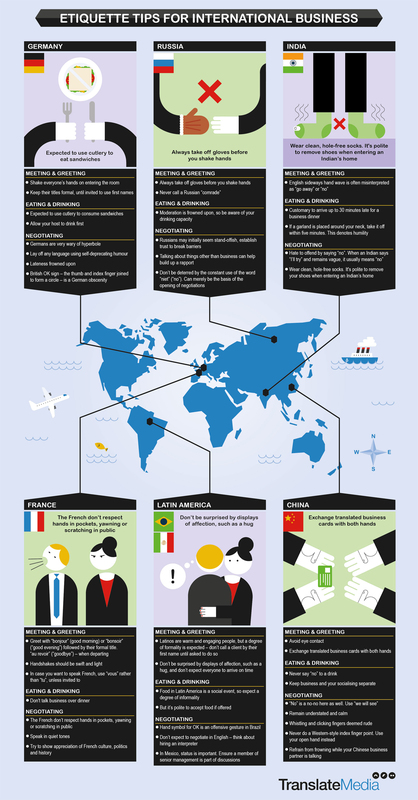 Check out our infographic on international business etiquette.